Yeah, I suspect you have figured out already from that blog post title just what I've been doing! My studio had reached the point of either having to move out, or shovel it out. I opted for shoveling because I really like where we live. Two and a half days of solid slugging and it now looks just about the same as it did before I started. Yep....there's still piles of 'stuff' everywhere, but at least the piles have a purpose now and aren't just hodgepodges of mess. So, I will send you off to have a look at THIS instead! My friend Pam has a wonderful board on Pinterest with tons of ideas for color palettes. For those of us who sometimes struggle with colour choices there are plenty of ideas here. And the quote for today, from J.C. F. von Schiller..... "Happy is he who learns to bear what he cannot change"
I finished knitting these teeny-tiny little baby socks last night and I am seriously in love. Such baby cuteness!!! The pattern is 'Get To Work!-Baby Socks' by Laura Sapergia and can be found on Ravelry. The quote of the day, from Sophia Loren.... "There is a fountain of youth; it is your mind, your talents, the creativity you bring to your life and the lives of the people you love. When you will learn to tap this source, you will have truly defeated age"
Although I know there's no need for two blankets, I made this one more as a family heirloom of sorts. The yarn that I used came from the baby's maternal great-grandmother and I thought it would be nice to use it to make something for the baby. The yarn itself isn't as soft as I would have chosen myself, but it's the history of it that makes it fun. Today's quote is from Tennessee Williams.... "Life is all memory, except for the one present moment that goes by you so quickly you hardly catch it going"
I simply could not resist making this little hat! Our son is a chef and this is a crocheted baby chef's hat...what could be more perfect, at least for photo ops? It's very difficult for me to get a proper picture of this, but I think you can get the general idea. The pattern was found on Ravelry and is the 'La Petite Chef Hat' by My Crimson Clover. Today's quote, by the infamous Anonymous... "Don't be afraid to attempt something new. Remember it was amateurs who built the ark. It was professionals who built the Titanic"
The crochet pattern is to be found HERE. they know how to play"
......that the reports of my early demise have been grossly exaggerated. Yes, I survived the 'talk/trunk show'. I didn't notice anybody topple off their chair having fallen asleep...nor did anybody get up and leave. Several of the ladies even came up and thanked me afterwards (mind you, I'm not quite sure if they were actually thanking me for what I said or for the fact that I'd finally shut up). I didn't want to ask because I was afraid of what the answer might be! This quilt guild is quite new, having been started to give an alternative meeting time to the afternoon guild which has a membership of over two hundred. Not everyone is available to attend afternoon meetings, so it certainly is nice to be able to go at night. Of course some of the ladies are now members of both. The evening group seems like a fun group and I think they are doing some fun things. Currently they are doing a year-long challenge - each participating member was given a baggie filled with small pieces of fabrics, some beads, buttons, lace and little bits and bobs and then they have a year to create 'something' using the contents of their bags (they can include other things from their own stash as well). They gave the bags out last night and it was great fun to see what some of them got. I get the honour of going back in a year and judging the challenge. Hmmm....nice idea, in theory, but it might mean I'll have an entire roomful of ladies mad at me for not picking their creation! And, in further news, it appears that the upcoming (2nd) hussif workshop I will be teaching for the daytime guild has filled up with fifteen people having been deluded into thinking I might manage to teach them something about crazy quilting. It also appears there is a distinct possibility of yet another waiting list being started to offer it a third time. 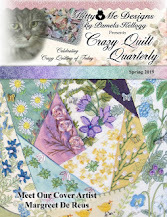 Who knew that there would be so much sudden interest in crazy quilting in this area? around here today so therefore no pictures to be had. Today's quote, courtesy of Suzy Szasz.... "Some misfortunes we bring upon ourselves; others are completely beyond our control. But no matter what happens to us, we always have some control over what we do about it"
I'll bet THAT post title got you wondering, didn't it!! entrusted with it is a huge honour. It will certainly be appearing in some of my creations! The shooting part of this post involves my usual feeling of 'shoot me now' when I have to do any form of public speaking. Tonight I have been asked to do a trunk show of my crazy quilting pieces for the local night-time quilt guild. Fortunately they only (!) have 50 members and, because they're now calling for freezing rain, hopefully they won't show up!!! I really do hate having to speak in public (as my many, many trips to the bathroom prior to the event will attest!). One of my friends, upon hearing that indelicate comment, very brightly said that I should look on the bright side...at least I don't have to pay for a cleanse!!! Today's quote is from Ray Bradbury.... "Living at risk is jumping off the cliff and building your wings on the way down"
....and the back on the right. The back wasn't a feature on the original pattern and came about because I messed up on the first purse I made and didn't read the directions properly (oops). It ended up being something I really liked, so I have continued to add it. Pattern: 'The Gadabout' by Studio Kat Designs. Remember that baby sweater I showed the other day? Well I simply had to make these little tennis shoe bootees to go along with it! And for today's quote.... "Although the past is over and the future is never quite here, our minds are usually so involved with one or both of them that the present serves very little function except to form a bridge between the two"
and can be found on Ravelry. The book is the one that both of our boys absolutely ADORED when they were little. The parents? Not so much....after having read it to them at least a couple of gazillion times its charm tended to wear a little thin! It will be fun to see if our wee one will find it to be as wonderful. This is the completed front of purse number two. This morning we had the pair of woodpeckers at our suet on our balcony. Today's quote is from Ralph Waldo Emerson... "To laugh much; to win respect of intelligent persons and the affections of children; to earn the approbation of honest critics and endure the betrayal of false friends; to appreciate beauty; to find the best in others; to give one's self; to leave the world a little better, whether by a healthy child, a garden patch, or a redeemed social condition; to have played and laughed with enthusiasm, and sung with exultation; to know even one life has breathed easier because you have lived, this is to have succeeded"
This is one of the fronts of the purses completed. It's a good day to stay inside stitching because it's snowing and blowing and completely and utterly miserable out. 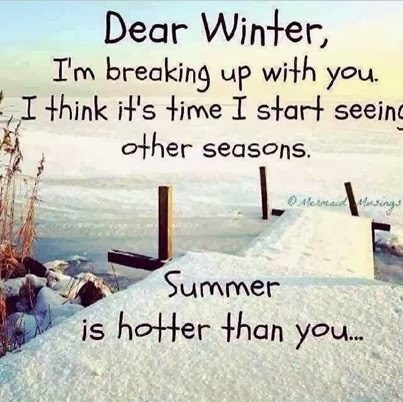 I'm SO done with winter! Today's quote is from that infamous person named Anonymous...."Measure wealth not by the things you have, but by the things you have for which you would not take money"
Yesterday Jack and I had somewhat of a 'sanity day' and toodled off and explored. Well, truthfully, the entire day wasn't total pleasure because Jack had to first go for his yearly physical bloodletting, but after that we had fun! We hit our two absolute favourite thrift stores in quest of baby clothing cuteness for our expected grandbaby in June. Wow - so much cute (and some of it came home with us to be washed thoroughly and packaged up to await the arrival of baby). Then it was off to a place called 'Len's Mills' which is a grand place to explore. My main quest there was to pick up some nice flannelette to make some receiving blankets. Mission was accomplished. Then it was a pit stop to inhale the marvelous scents at the 'Grande Cheese Factory' outlet. Mmmmm. Of course some cheese managed to hop right on into our cart!! Then it was off to have supper with our 'expectant' son and d-i-law. All in all a perfect day! Needless to say, however, no stitching was done. Thanks to Liz, I have been having a wonderful experience watching a live cam of a pair of eagles and their baby. It's a live feed 24 hours a day and is so amazing to see. Go HERE. we must give what we are"
"The circumstances amid which you live determine your reputation; the truth you believe determine your character. Reputation is what you are supposed to be; character is what you are. Your reputation is made in a moment; your character is build in a lifetime. Reputation makes you rich or makes you poor; character makes you happy or makes you miserable. Reputation is what men say about you on your tombstone; character is what the angels say about you before the throne of God"
It's snowing....again (or is it yet? 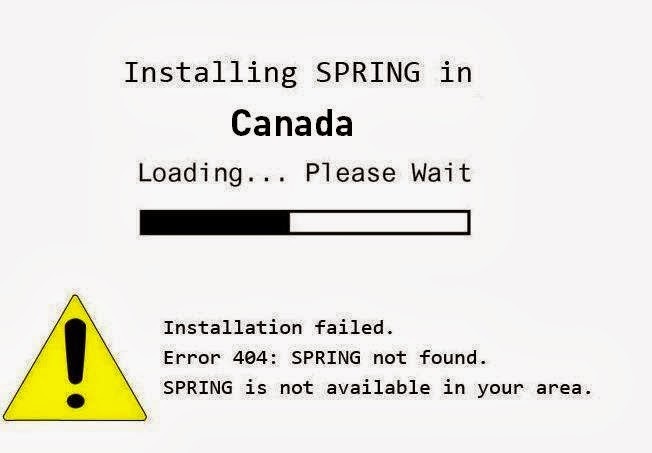 )....and therefore a good day to spend inside stitching flowers and dreaming of spring. long yet live very little"
....that I actually do something besides crazy quilt! I'm not a good knitter by any means but I don't think our expected grandbaby will care that it's not perfect. "To laugh often and much, to win the respect of intelligent people and the affection of children; to earn the appreciation of honest critics and endure the betrayal of false friends; to appreciate beauty; to find the best in others; to leave the world a bit better, whether by a healthy child, a garden patch or a redeemed social condition; to know even one life has breathed easier because you have lived. This is to have succeeded." 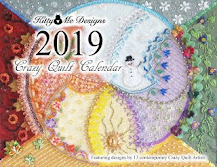 For those of you who are possibly wanting to learn crazy quilting, Kathy Shaw (Shawkl) is offering very reasonably priced (FREE!!!!!) online classes. Go HERE to learn more and to register. Kathy is one of the most 'giving' souls in the CQ world, so if you're thinking about learning, please consider taking advantage of this. Today's quote comes from Robert Frost... "Something we were withholding made us weak, until we found it was ourselves"